It might be surspising that a seemingly small detail (the young hare half hidden in the grass) has been chosen as the title of this painting. The explanation for this is my admiration of Dürer, who, with truly universal knowledge, was one of the most 'authentic' Renaissance men. 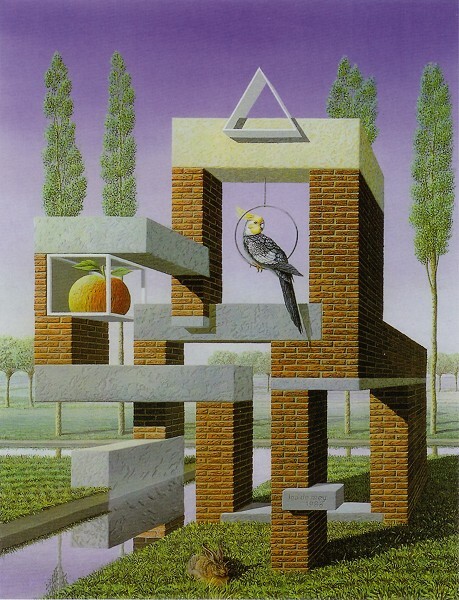 In addition to a number of impossible connections (at least four) the painting also contains the three basic architectural forms: the square in the showcase with the apple, the triangle crowning the building and the circle in the form of a hoop, where a huge parakeet is resting.